What is the real power behind women entrepreneurs? A study by the Center for Women’s Business Research shows that women now own 40 percent of private firms, women-owned businesses generate about $3 trillion in revenue, and employ 16 percent of the workforce; making them significant players in the national economy. In addition, the study found that 85 percent of women surveyed do not believe being a woman is detrimental to their business success, and 32 percent believe being a woman is beneficial. Below are 9 powerful social networking sites for women entrepreneurs. CAUTION: Your business could increase and expand if used wisely. A.Michelle Blakeley is the Founder and CEO of Simplicity, Inc.; a progressive small business development firm. She manages her clients’ business expectations and prevents information overload via Micro Business Therapy™ and Micro Business Action Plans. She is also the host of Simple Truths: Intelligent. Insightful. Informed. on BlogTalkRadio.com. Virtual Trade Shows: More Cost-Effective Way of Generating Leads? 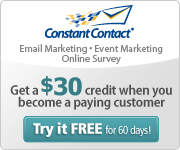 Want to save a bundle generating leads? Follow these steps. Traditional trade shows have long been a convention-center-sized hassle. “At a physical show, you have hundreds of vendors in a crowded, noisy exhibit hall with competing messages,” says Appelbaum. “It’s really hard to know who’s worth talking to.” Throw in a recession and it’s little wonder that overall trade show revenue ($12 billion at last count in the U.S.) is expected to contract nearly 7% this year. Hence the rise of virtual trade shows, designed to look and function like the real thing but that play out in real time in cyberspace. Entry fee: just $3,000 to $8,000. Better yet, you don’t need to be a computer wizard to participate. Revenue generated by North American web events hit $156 million last year, according to Frost & Sullivan’s 2009 World Web Events Services Market Report. Show hosts (event producers) pay an event firm $20,000 to $50,000 to create the custom virtual environment; they make the money back by charging exhibitors fees to set up their booths, make presentations and even buy additional, premium advertising. 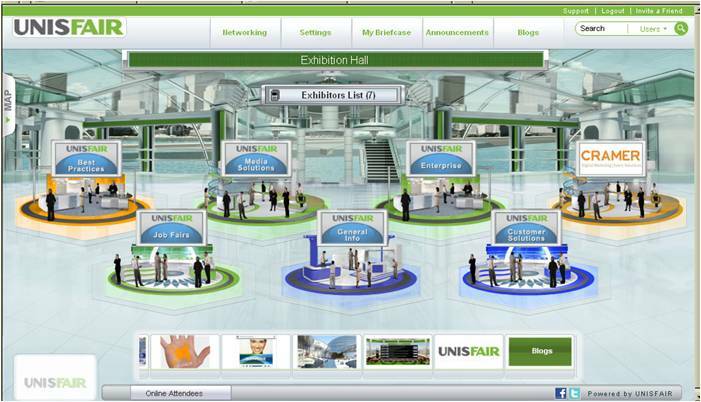 Before you invest a dime in showcasing at a virtual trade show, get a feel for the environment. (Most shows are free for attendees.) You can also contact the show host (producer) to arrange a demo walk-through. “Browse” the booths and listen to a few seminars to get a feel for the style and length of presentations. Unlike in the physical world, setting up a booth eats all of 30 minutes and takes no sweat. Some virtual design companies will construct a booth free of charge; all you have to do is set up a brief phone call to lay out the general design, and send them your materials (white papers, logos and audio and video clips) for formatting. If you’d rather do it yourself, you can log onto the web design firm Web site and work within a template wizard that walks you through the process. As for placement, “It absolutely helps drive attendees if you pay for prime real estate in the virtual exhibit hall,” says the founder of a virtual design firm. Generally, attendees “enter” the exhibit hall from one main doorway, so getting near that portal is important. Prime placement could run a few thousand dollars more, but it’s still significantly cheaper than a bad spot at a physical show for $25,000. During designated show days (some events run a single day, others go on for months), have a representative from your company logged in and prepared to engage booth visitors. When an attendee visits your booth, their name appears in a sidebar list of all the people present, and you can greet them in the form of an instant message. When you IM visitors, they immediately see your name, business affiliation and title; for more information, they can click on your name to view your profile. “Last month I worked my booth while on a flight from Atlanta to Portland,” says Jeff Pedowitz, chief executive of Alpharetta, Ga.-based marketing firm the Pedowitz Group. Pedowitz recently set up a virtual booth at the B-to-B Magazine show, where he says he ginned up some 50 leads for his marketing services. Not a bad return for a $5,000 investment. Just when you might think you’ve heard it all, now small businesses can take a lesson from Santa!A recent article describes a comprehensive social media strategy recently put in place by NORAD (the North American Aerospace Defense Command) to track Santa’s progress this holiday season. While obviously meant to be a fun activity, closer reading of the story actually displays a well thought out and comprehensive Social Media Marketing Strategy that small business owners would do well to emulate in their own marketing efforts! So take a lesson from Santa and consider what Social Media Marketing can do to help you grow your business. Visit our website to learn more about Social Media Marketing, and if you need assistance developing your own Social Media Marketing Strategy, please feel free to contact the experts at Strategic Growth Concepts via email at info@StrategicGrowthConcepts.com or via our website by clicking HERE. And here you thought all they did was patrol the skies for the bad guys! Heck no, even the North American Aerospace Defense Command need to have some fun.The NORAD Tracks Santa Web site, www.noradsanta.org, is now live and features fun holiday games and activities that change daily. The Web site is available in seven languages: English, French, German, Italian, Japanese, Spanish, and Chinese. On Dec. 24, the Web site will track Santa Claus’ annual trip, streaming videos, captured by NORAD “Santa Cams,” from numerous cities along Santa’s journey.This year, children and the young-at-heart are able to track Santa through Facebook, Twitter, YouTube, Flickr, and TroopTube.mil. To follow Santa on any of these Web sites, type in @noradsanta into the search engine and start your tracking.Also new this year: Detroit-based OnStar is partnering with NORAD to provide OnStar subscribers with live Santa updates as they travel in their vehicles on Christmas Eve. Subscribers simply push the blue OnStar button to get status reports on Santa’s whereabouts.Also new and beginning at midnight Mountain time Dec. 24 (2 a.m. Eastern time), visitors to the Web site can watch Santa as he prepares his sleigh, checks his list, and goes through all his preparations to ensure he has a successful journey. Santa trackers will begin answering phones and replying to email at 4 a.m. Mountain time (6 a.m. Eastern time) on Christmas Eve. Children of all ages can call the NTS toll free number (877) Hi-NORAD (446-6723) or send an email to noradtrackssanta@gmail.com. The NTS program is carried out with the assistance of many corporate partners. Booz Allen Hamilton has designed the NTS Web site. Other sponsors helping with the event include Verizon, who donates the toll-free number, Time Warner, Avaya and PCI provide communications engineering, while OnStar, 5 Star Bank, Pepsi Distributing and First Choice Awards and Gifts keep the trackers happy with food, beverages and souvenir tracking pins. The NTS program began on Dec. 24, 1955, after a phone call was made to the Continental Air Defense Command Operations Center in Colorado Springs, Colo. The call was from a local youngster who dialed a misprinted telephone number in a local newspaper advertisement. The commander at Cheyenne Mountain Air Force Station, Colo. who answered the phone that night gave the youngster the information requested — the whereabouts of Santa. This began the tradition of tracking Santa, a tradition that was carried on by NORAD when it was formed in 1958. The NTS program has grown immensely since first presented on the Internet in 1998. The Web site receives millions of unique visitors from hundreds of countries and territories around the world. In addition, the NTS Operations Center will be occupied for 25 hours with over 1,200 volunteers on Christmas Eve, who will be receiving hundreds of thousands phone calls and emails from families around the world.